There has been great debate over who actually made the first “madeleine”. Some say there was actually a girl named Madeleine, a young peasant who was asked to create this special confection for the deposed king of Poland who had sought refuge during the 17th century, in France. French author Marcel Proust was the first to truly “immortalize” the madeleine. His autobiography, “Remembrance of Things Past” talks of being transported back to childhood the moment he takes a bite of this indulgent bite-size treat. In France today you will notice mothers allowing their children to enjoy snack-time with this comforting confection. Mind you, lunchtime in France is normally between noon and 1pm, while dinner is 7:30pm…..quite a long stretch for a child who is hungry and growing! 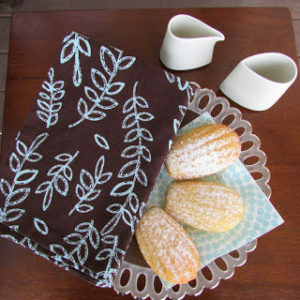 As much as I love French Madeleines, every time I tasted one I was expecting a burst of flavor that just was not there. I have spent time testing (and tasting!) them, and have added even more natural flavors to the interior of this delicate cake. It is typically a sponge cake texture, but I have made it richer so that each bite is worth it:) The typical “one day” shelf life I have been able to extend by “glazing” the outside of the madeleine. You can now have them sit on your counter, covered and sealed for 4 days, without any drying out. Please do not refrigerate or freeze them! So….you must decide….cake or cookie? One bite and you will rethink the once commonplace tea cake known as the “French Madeleine”.